I decided to combine yesterday and today’s adventures into one as it marked my last day in Paris and my first day in Rome. On Sunday morning, we started our day with breakfast at Angelina’s (right down the street from the Louvre) where I ordered the Angelina breakfast, complete with French croissants, pastries, sunny side up eggs, and rich Angelina hot chocolate. I could barely drink a quarter of the hot chocolate because it was so rich and velvety, but it was definitely something worth trying! An hour later we walked over to the Louvre where, of course, we spent the next 30 minutes trying to get a good picture with the building and the massive triangle. Around the Louvre there was an abundance of French troops stationed to ensure the safety of the region as the Je Suis Charlie peaceful rally was occuring nearby. Outside the pyramid at the Louvre! Once we took our photos, we headed into the Louvre. I broke off from my friend and my sister and I set off to find Mona and check out some Islamic traditional art. I had seen the Louvre once before and after seeing D’Orsay’s collection, believe it or not, I honestly prefer D’Orsay to the Louvre. The Louvre had more Medieval and Neoclassical art and artifacts, where as Impressionism and Post-Impressionism were prominent at D’Orsay. Additionally, D’Orsay was far easier to navigate! At sunset, we visited the beautiful Eiffel Tower. The tower was closed for tourists as the rally was occuring and the troops that would normally guard the tower were required elsewhere. For dinner we went to the adorable French cafe near our hotel and then set sail for the Seine river tour. Aboard the tour we saw all of Paris’ great sights and learned a bit of history in the meantime. Though unfortunately, Sunday night was the coldest night yet, and being on the Seine made it that much colder! Today we said goodbye to Paris by doing as the Parisians do and we went to Ladurée for breakfast. I’m speechless as to how amazing my omelette was and how beautiful the interiors of the boutique and tea room were. Enjoying pistachio macarons from Laduree on the way to the airport! After breakfast we left for Orly airport and took off for the true city of love, Roma! We enjoyed a lovely Italian dinner complete with champagne and pasta. Now its 1 am and I’m hurrying to type this as I’ve a long and fun day ahead of me tomorrow, ciao! 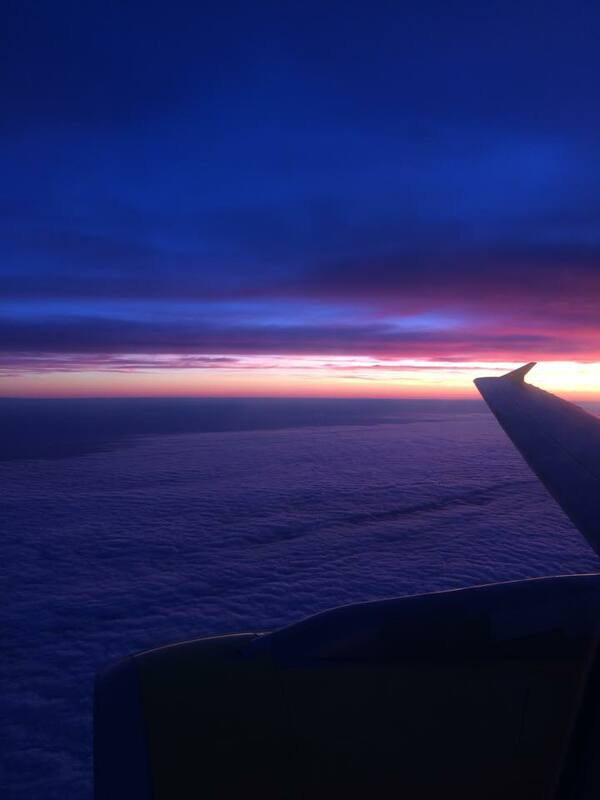 The beautiful sunset on the plane ride to Rome, leaving Paris.